Abstract: During the past 10 years, transcatheter aortic valve replacement (TAVR) has emerged as a valuable alternative treatment option for patients with severe symptomatic aortic stenosis at high surgical risk. We present the case of a 69 year-old man with symptomatic severe aortic stenosis deemed to be inoperable because of severe biventricular systolic dysfunction. TAVR was successfully performed as a last-resort option within a recently launched national programme covering such procedures in the public healthcare system. Keywords: severe aortic stenosis, transfemoral TAVR. When patients with severe calcific aortic stenosis (AS) develop symptoms, survival at 2 years is less than 50%, and by five years less than 10% of these patients are alive1. Surgical aortic valve replacement (SAVR) improves not only symptoms, but also survival2. Transcatheter aortic valve replacement (TAVR) is recommended in patients with severe symptomatic AS who are not suitable for surgery and with an estimated life expectancy >1 year (class I, level B), or should be considered when there is a high surgical risk as assessed by a heart team (class IIa, level B)2. We present the case of a 69 year-old patient who was diagnosed 8 months previously with symptomatic calcific aortic valve disease (severe stenosis, mild regurgitation) and biventricular dysfunction. Since the diagnosis he has suffered two episodes of acute decompensated congestive heart failure, the last one requiring high doses of intravenous furosemide with progressive loss of 10 kg of accumulated fluid. Associated comorbidities were type 2 diabetes mellitus and chronic kidney disease stage II. On the current admission the patient described NYHA class III heart failure symptoms. The clinical examination revealed systemic congestion (jugular vein distention, hepatomegaly), and an ejection-type systolic murmur (grade 3/6) best heard in the aortic area that irradiated on both carotid arteries. He had no peripheral oedema or pulmonary rales. Electrocardiogram showed sinus rhythm and left ventricular hypertrophy with secondary ST-T changes. The BNP level was severely increased (4040 pg/ml). 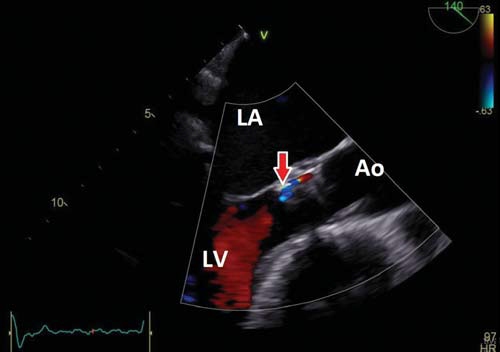 Transthoracic echocardiography (TTE) revealed a severely stenotic, calcified trileaflet aortic valve (functional aortic valve area, AVA, of 0.6 cm2 , mean transaortic gradient of 50 mmHg) and mild aortic and mitral regurgitation (Figure 1 A and B). The left ventricle (LV) was hypertrophied, with normal cavity size and severely reduced global systolic function (LV ejection fraction, LVEF, of 25%, as assessed by biplane Simpson’s method). TTE also showed moderate secondary tricuspid regurgitation with an estimated systolic pulmonary artery pressure (PAPs) of 60 mmHg. The right ventricle (RV) was dilated (RV basal diameter 43 mm) with significant global systolic dysfunction (RV fractional area change of 25%, TAPSE of 12 mm). Coronary angiography showed normal coronary arteries and right heart catheterization confi rmed the isolated post-capillary pulmonary hypertension (PAP 69/24 mmHg, mean PAP 41 mmHg, mean pulmonary capillary wedge pressure 31 mmHg, pulmonary vascular resistance 3.03 WU). According to the current European Society of Cardiology guidelines on the management of valvular heart disease, the patient has a class I indication for aortic valve replacement2 . The surgical risk score was assessed by logistic EUROSCORE (16%) and by the Society of Thoracic Surgeons (STS) criteria (2.64%). Due to the severe biventricular systolic dysfunction, the ‘heart team’ considered this patient at high-surgical risk and TAVR was recommended. Therefore, the patient was evaluated for the feasibility of TAVR by transesophageal echocardiography (TEE) and multi-slice angio-CT reconstruction for evaluation of both the aortic root and arch and also for the iliofemoral axes. TAVR was considered feasible and given the results of TEE and CT tests, a 26 mm Edwards Sapien valve was chosen. The procedure was performed under general anaesthesia using transfemoral access, under 2D and real time 3D TEE monitoring. After balloon predilatation of the stenotic valve (Figure 2), the prosthesis was positioned under fluoroscopic and TEE control and the valve was released by dilating the balloon during an induced episode of ventricular tachycardia. Figure 2. Intraprocedural TEE, mid-esophageal long-axis view. 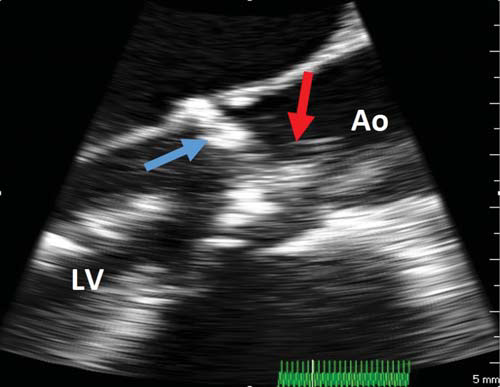 Baloon predilatation (red arrow) of the stenotic calcific aortic valve (blue arrow). Ao = aorta, LV = left ventricle. At the end of the procedure the prosthetic cusps were moving well (Figure 1C), the valve stent had a circular configuration, there was no significant residual transprosthetic gradient (Figure 1D), no significant transprosthetic regurgitation and only mild paraprosthetic regurgitation with a posterior location, at the level of a severe calcification of the aortic annulus (Figure 3). The patient’s in hospital course was good, with swift clinical and echocardiographic improvement. At discharge he was in NYHA class II with a global LVEF of 45% (Figure 4). PAPs decreased from 60 to 35 mmHg as assessed by CW Doppler echocardiography and the RV systolic function improved (FAC 35%, TAPSE 22 mm) (Figure 5). No neurological or haemorrhagic complications were observed. He was discharged under treatment with clopidogrel (for 6 months) associated with aspirin, bisoprololum, enalapril and furosemide. Figure 3. Post procedural TEE long axis view showing mild posterior paravalvular regurgitation (red arrow). Ao = aorta, LA = left atrium, LV = left ventricle. Figure 4. Comparison of LV systolic function before and after TAVR. A. M-mode of the LV in the PLAX view before TAVR showing severe LV systolic dysfunction (LV fractional shortening=15%). B. M-mode of the LV in TEE transgastric view immediately after TAVR showing significant improvement of the LV systolic function (LV fractional shortening = 30%). Transcatheter aortic valve replacement (TAVR) has become an established treatment for patients with calcific AS as randomized trials have demonstrated its superiority over standard medical therapy for patients with prohibitive surgical risk, and comparable results between TAVR and surgical aortic valve replacement (SAVR) in the high-risk population3,4. Figure 5. Comparison of the right ventricular systolic function and of the right ventricular-right atrial systolic pressure gradient before and after TAVR showing improvement in right ventricular function and reduction of pulmonary artery pressure after TAVR. 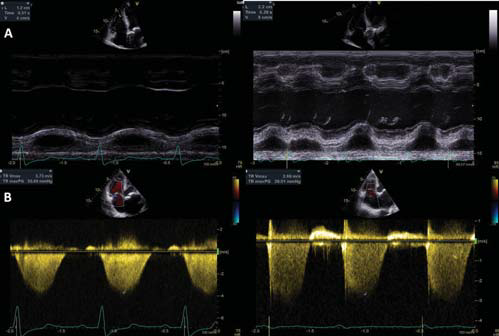 A. Tricuspid annular plane systolic excursion (TAPSE) before (12 mm) and after (22 mm) TAVR. B. Right ventricular-right atrial systolic pressure gradient before (55 mmHg) and after (29 mmHg) TAVR. The key to a good outcome is the correct patient selection. The ability to predict surgical risk is limited. Currently available objective tools include the STS risk score and the EuroSCORE. High-risk surgery corresponds to a STS score >8-10% or a logistic EuroSCO RE >20%. However, a number of comorbid conditions associated with adverse surgical outcomes are not included in these risk calculation scores, including right ventricular dysfunction/failure, such as in this case. A retrospective analysis performed by Cavalcante at al. showed that the presence of RV dysfunction in patients with AS provides important prognostic value and risk stratification adjunctive to STS score and it should be incorporated into the decision-making process5. It is without doubt that RV dysfunction in patients undergoing SAVR leads to adverse outcomes6. On the other hand, Poliacikova et al showed no significant effect of RV dysfunction on mortality outcomes with TAVR7 . Furthermore, TAVR provided significant improvement of RV dysfunction at the 1 month and 6 months follow-up in another prospective echocardiographic study8. However, one cannot make the assumption that all patients with RV dysfunction would be better treated by TAVR. Future studies to develop risk models for TAVR outcomes that include RV dysfunction as a variable are needed. The guidelines recognize the limitations of the current risk scores and recommend that the indication for TAVR should be decided by a multidisciplinary heart valve team consisting of clinical cardiologists, interventional cardiologists, cardiovascular surgeons, imaging specialists, and anesthetists 2. There is now a clear trend towards performing TAVR even in intermediate-risk patients. Offering TAVR to patients at lower risk for surgical morbidity and mortality is intuitively attractive, but remains controversial. The Nordic Aortic Valve Intervention (NOTION) trial was the first randomized trial addressing low – and intermediate-risk patients. The primary outcome of stroke, myocardial infarction, and all-cause mortality at 1 year was 13.1% for TAVR and 16.3% for SAVR (p = 0.43), but these results are limited by the relatively small population included (280 patients)9. The results of larger randomized trials are awaited (SURTAVI trial, PARTNER II trial – intermediate risk cohort). Perioperative complications (stroke, paravalvular regurgitation, renal failure, access site vascular complications and advanced atrioventricular block requiring permanent pacemaker implantation), as well as lack of data on long-term durability of the percutaneous valves, are among the key concerns for expanding indications for TAVR to lower-risk patients. In summary, we presented the case of a 69 year old man with symptomatic severe AS considered by the heart team to be at high surgical risk because of severe biventricular systolic dysfunction. TAVR was successfully performed as a last-resort option within a recently launched national programme covering such procedures in the public healthcare system. Conflict of interests: none declared. 1. Chizner MA, Pearle DL, deLeon AC Jr. The natural history of aortic stenosis in adults. Am Heart J 1980;99:419. 2. Vahanian A, Alfieri O, Andreotti F et al. Guidelines on the management of valvular heart disease (version 2012). European Heart Journal 2012;33:2451–2496. 3. Leon MB, Smith CR, Mack M, et al. PARTNER Trial Investigators. Transcatheter aortic-valve implantation for aortic stenosis in patients who cannot undergo surgery. N Engl J Med 2010;363:1597–1607. 4. Smith CR, Leon MB, Mack M, et al. PARTNER Trial Investigators. Trans catheter versus surgical aortic-valve replacement in high-risk patients. N Engl JMed 2011;364:2187–2198. 5. Cavalcante JL, Rijal S, Althouse AD, et al. Right Ventricular Function and Prognosis in Patients with Low-Flow, Low-Gradient Severe Aortic Stenosis. J Am Soc Echocardiogr 2015 Dec 30. pii: S0894-317(15)00931-1. 6. Nagel E, Stuber M, Hess OM. Importance of the right ventricle in valvular heart disease. Eur Heart J 1996;17:829–36. Aortic Valve Implantation. J Invasive Cardiol 2013:25:142–145. 8. Ayhan H, Durmaz T, Keleş T, et al. Improvement of right ventricular function with transcatheter aortic valve implantation. 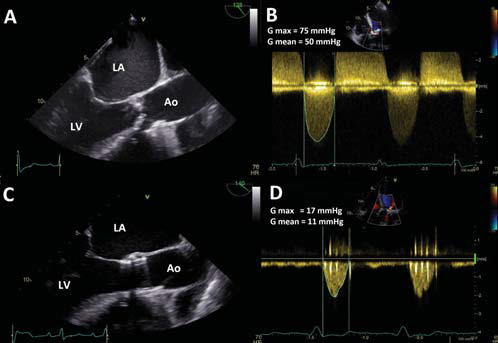 Scand Cardiovasc J 2014;48:184-8. 9. Thyregod HG, Steinbruchel DA, Ihlemann N, et al. Transcatheter versus surgical aortic valve replacement in patients with severe aortic valve stenosis: one-year results from the all-comers Nordic Aortic Valve Intervention (NOTION) randomized clinical trial. J Am Coll Cardiol 2015;65:2184-94.